As we entered, the Massey Theater was bustling with opening night excitement. 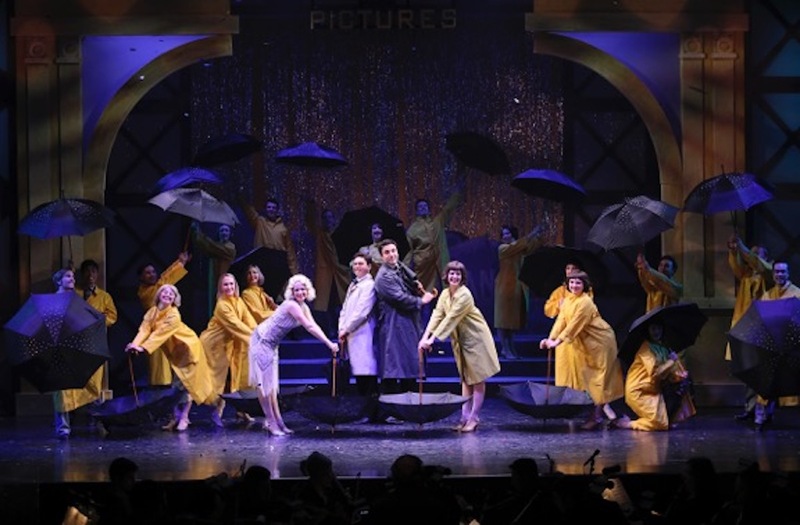 The live orchestra tuned up in the pit and audience settled in to a performance of the musical, Singing in the Rain. I would say that the RCMT had big shoes to fill, taking on the challenge of this a fast-paced, much-beloved musical. And I think, overall, they delivered. As a whole, the performance was crisp and complex. Whether the cast was dancing en masse, in a trio, a duo or on their own; director and choreographer Valerie Easton brought the show to life and successfully recreated those iconic moments which hearkened back to the original movie. And, in fact, I would venture to say, the live ‘tapping’ was one place where the show out-shone its movie counterpart. It was a unique and captivating thing to experience the cast dance the stage in unabashed, old school tap numbers. Musical Director, James Bryson, conducted the orchestra expertly and was incorporated into the play in 2nd act, a nice tribute to his many years with the company; taking part of one of the ‘laugh-out-loud’ moments in the play. To live up to the charisma that Gene Kelly brought to this role is a daunting task, to say the least, but Cohen (whose credits include Buddy in Elf and as well, has won two Ovation awards) did the role justice with his jaunty exuberance and picture perfect dancing. Trach, (who has been seen in A Christmas Carol and in Grease), gave a sparkling performance of Kathy Selden. 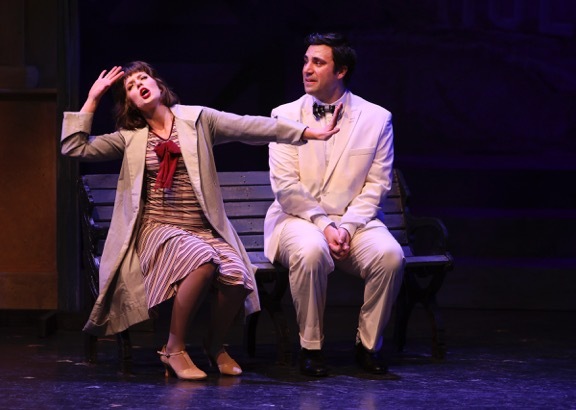 The comedic Blake Sartin (who has played Billy in 42nd Street and Henry in Next to Normal) negotiated an energetic and deft performance of Cosmo Brown and he ‘made us laugh’ both physically and verbally throughout the play. 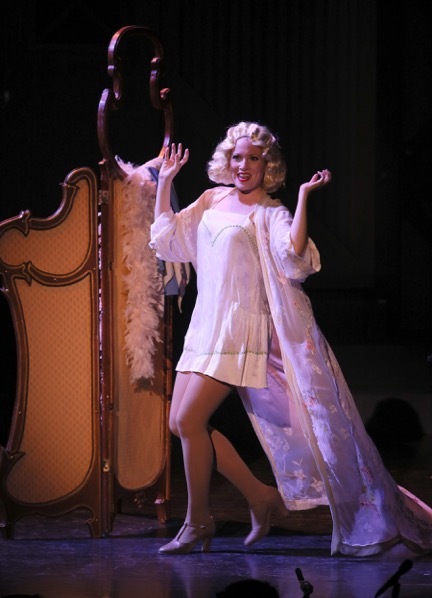 By no means forgotten, and at moments stealing the show, was Robyn Wallis (whose credits include: Jeeves Takes a Bow and Noises Off!) who delighted the audience with her razor sharp portrayal of Lina Lamont. RCMT embraced its 30th year continuing to strive for excellence. This performance was challenging. Challenging roles all around, challenging comedy, challenging choreography, challenging dialogue, and perhaps the most challenging part of all… portraying a musical that everyone knows so well. Judging by the standing ovation, I would say that RCMT not only met the challenge but rose beyond it to give the audience an Opening Night of classic delight!